AppDelete with a list of apps in your /Application folder. Screen shot courtesy of Coyote Moon, Inc.
Removes apps, widgets, plugins, preference panes, and much more. Fast search algorithm for finding related files. Full preview before deleting; you know what's going to happen. App protection lets you keep favorites from being deleted. Orphan search finds app files related to apps you've already deleted. Undo for when you click trash a little too quickly. Unlike the early days of using a Mac, uninstalling is no longer as simple as dragging an app to the trash. In many cases, there are assorted files, preferences, startup items, and more that the application's installer has scattered around your Mac. All of these extra files get left behind if you just drag the main app from the /Applications folder to the trash. That's why we're particularly happy with AppDelete from Reggie Ashworth. It works well and doesn't clog things up on your Mac. AppDelete is a useful tool to have, especially if you tend to install and uninstall a large number of apps. Normally, dragging an app to the trash works fine to get rid of the main body of an app. But this method does leave behind a few stray bits in the form of preference files and other data files the app uses. In some cases, there may even be hidden daemons left behind, small apps that run in the background consuming resources. Having a few extra files and even daemons running about won’t cause many grievances to your Mac, but over time, they can really add up, and start to have an effect on how your Mac performs, especially if you have limited resources on your Mac, such as a low amount of RAM. That’s why whenever you can, you should use the uninstaller or uninstall instructions provided by the app developer. But too many times, the developer never bothers to include an uninstaller, and never thinks to write up uninstall instructions. That's where AppDelete comes in handy. AppDelete can run in various modes, including a simple trash window where you drag and drop apps you wish to delete completely from your system. Once an app is dragged to the AppDelete trash window, all of its associated files, including the core .app file, will be displayed. Each item in the list includes a checked checkbox indicating the item will be deleted; you can uncheck any item you wish to keep. If you're not sure or wish to explore further, each item will have an Info button and a Display in Finder button. The info button will bring up the equivalent of the Finder's Info box for the selected item. You can see where the item is located when it was last used, how the permissions are set for the file and other bits of information. The Display in Finder button can at times be much more useful. Have you ever had a problem with how an app is working, and after searching the web for answers, the consensus seemed to be to delete the app's preference file (its .plist file)? Which brings you to the next question: how the heck do you find the .plist file for the app, and then delete it? If you look through the AppDelete list for the app in question, you should be able to spot the .plist file. Click on the Display in Finder button to open a Finder window on the folder that contains the file, and simply delete the .plist file. In this case, you used AppDelete to quickly find a preference file for a wayward app. Let's get back to using AppDelete as intended. AppDelete lists all of an app's associated files. You can scan through the list and uncheck any file you wish to keep, but for the most part, AppDelete is pretty good at only grabbing files that really belonged to the app in question. When you're ready to complete the uninstall process, you can click the Delete button, which will move all the files to the trash. By the way, AppDelete also includes an undo command; as long as you don’t erase the trash, you can use the undelete command to recover the removed app. A very helpful feature in AppDelete is the Archive function, which works as an alternative to the normal delete function. When you choose Archive, the selected app and all of its associated files will be compressed in .zip format and stored in a location of your choice. The beauty of the Archive option is that at any later date, you can use AppDelete to reinstall the app from the stored archive. Another option in AppDelete is to simply log all of the files used by an app to a text list. The list includes the pathname for each file used by the app. This can be handy for troubleshooting, or manually removing files, should you have a need to. So far, we've used AppDelete as an uninstaller when we know what app we want to get rid of, but what if you're just trying to clean up your /Applications folder to make some needed room on your Mac? That's where Genius Search comes into play. If you've dragged apps to your Mac's trash in the past without using AppDelete, then there's a good chance you have a few orphaned files laying about. 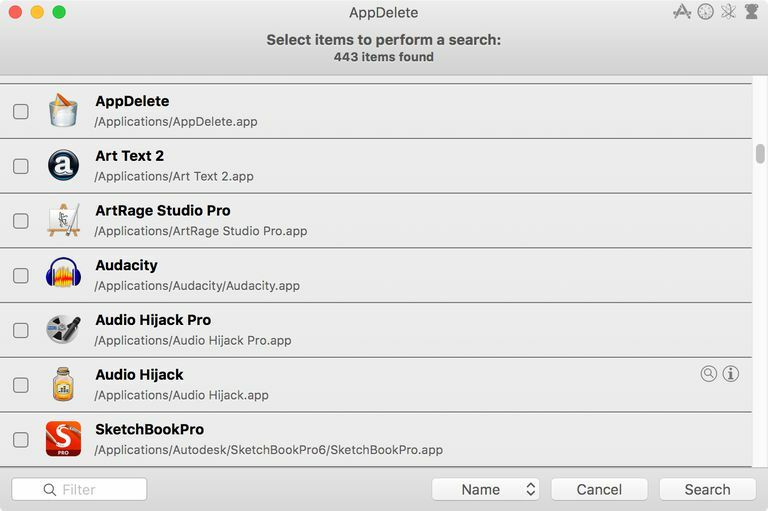 Orphaned files are app-related files that were left behind when you used the simple drag-to-the-trash method of deleting an app. By invoking Orphaned Search, AppDelete can find all of the files left behind that serve no practical use anymore, and allow you to delete them. There are a few other app uninstallers available for the Mac, including AppCleaner, iTrash, and AppZapper. But one of the reasons you'll like AppDelete is because of how fast its search function is. Because it's so fast, you don’t need to have it always running, monitoring the Mac for app installations or intercepting file updates, and other techniques used to keep track of apps and their files used by other universal uninstallers. This means AppDelete places no demands on Mac's resources except when we're using the app. If you're looking for a nifty trick to take advantage of this AppDelete capability of not needing to run in the background, but still have quick access, simply add AppDelete's icon to your Dock. You can then drag any app to the AppDelete dock icon, and AppDelete will launch the selected app ready to be deleted. So, go ahead; try some of those app demos you always wanted to try but were afraid of being able to uninstall later; AppDelete will take care of the uninstall process for you. AppDelete is $7.99. A demo is available.